Californians have the right to not be bothered by unauthorized calls/text messages/faxes and the right to assume that consumer products/services they purchase will work as advertised. Sometimes, consumers must seek compensation in the court system for financial losses resulting from violation of their consumer rights. For example, a group of consumers who feel cheated out of their money due to a product’s false advertising claims can file a class action lawsuit against the maker of the product. Los Angeles consumer class action attorney and Gallenberg PC founder Rosa Vigil-Gallenberg has experience helping California consumers protect their rights. We offer a free confidential initial telephone intake to prospective clients. We also accept cases on a contingency fee basis. If you believe you are the victim of false advertising or your consumer rights have been violated, contact Gallenberg PC at (818) 237-5267 (Burbank) or (213) 986-8432 (Los Angeles) or (310) 295-1654 (Beverly Hills) or you can fill out our quick and easy online Case Evaluation Form; this is the fastest way to get your case screened by an attorney. We do not charge prospective clients for a confidential telephone intake or online case review. A Class action is a filed by one individual who seeks to represent a class of people that were similarly injured by the same defendant. The group of plaintiffs in a class action is called the class; each individual person is a class member. ne of the most common allegations in a consumer class action lawsuit is false advertising, sometimes called deceptive marketing. In these cases, a group of consumers sue product makers or advertisers who have made false or misleading claims about their products. A California law called the Unfair Competition Law (UCL) protects California consumers from unfair or deceptive marketing practices. Spam faxes, such as those advertising a product or service. Products that contain materials or other chemicals that if disclosed prior to the purchase would have led a consumer not to purchase that product. For example, a product contains formaldehyde, which the consumer did not know when it purchased it. This consumer may sue the manufacturer of this product for withholding this information. Any situation where consumers have been misled or lied to has the potential to be a class action lawsuit. Even if the product at issue was relatively inexpensive, the manufacturer or advertiser can be liable as long as they withheld information that would have kept a member of the class from buying the product. Why Should I File or Join a Consumer Class Action? Filing a class action lawsuit may be your best and only option. In an individual consumer lawsuit, damages at first may be small or hard to quantify, and therefore a lawsuit would be too expensive or impractical to file, thereby leaving the wrongdoer free to continue with its unlawful conduct. However, if this brought as a class action, all of the consumers/individuals injured by the breach band together, each member of the class can receive damages. In some cases even if damages cannot be recovered, an injunction can be issued by the Court to stop the wrongdoer from continuing to harm the consumers. For example, in a lawsuit against the manufacturer of a $10 product that does not work as advertised, any particular consumer may have suffered a relatively small amount of damages. However, this does not change the fact that the plaintiffs in the case unknowingly wasted money on the product, which is a form of financial injury. This is one example of a case where a class action lawsuit can be more effective than a traditional individual lawsuit. If all of the consumers injured by the $10 product band together, each member of the class can receive damages, even though the damages may have been too small to make filing a lawsuit on behalf of only one plaintiff worthwhile. If your consumer rights have been violated, or know of a corporation that is violating the rights of consumers, contact a class action attorney immediately. Gallenberg PC has extensive experience helping individuals pursue their class action claims. If you need a Los Angeles consumer class action lawyer contact us immediately. You can fill out our quick and easy online Case Evaluation Form; this is the fastest way to get your case reviewed by an attorney. You can also submit your case for review to a Los Angeles consumer class action attorney by dialing (213) 986-8432. For Beverly Hills, please call (310) 295-1654. 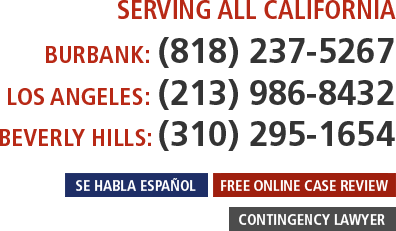 To submit your case to a lawyer in Burbank and surrounding San Fernando Valley, please call (818) 237-5267.